Lock in a great price for The Painswick – rated 9.6 by recent guests! The room was beautiful, the views around the hotel are stunning. The afternoon tea, dinner were amazing, staff very friendly and helpful, especially Flo. A beautifully designed property with lots of thoughtful touches e.g. the woodburner in our bedroom was set ready to light. The bar which is on the first floor is rather special and converted from an interesting former use - won't spoil the surprise! Lovely menu and beautifully executed and presented food. The staff went the extra mile to be helpful and were very friendly and efficient. Loved our stay. So welcoming! Great location for exploring the Cotswolds too. This is one of the most complete hotels we have stayed in. The attention to detail in every aspect was mind blowing. We have stayed in many 5 Star hotels that do not compare. The hotel was beautifully decorated, including our room, the staff very nice and helpful. The food was 5*. The terrace was really nice, especially for a last drink at the end of the evening. Great place to relax and unwind; either on comfortable sofas in front of a log fire or lounging outside on the terrace on huge sofas with a glass of fizz and spectacular views. Room was beautiful. Staff were amazing - nothing was too much trouble. Food fantastic. We'll definitely be visiting again. Great staff, great breakfast lovely rooms with thoughtful decor and finishing touches. Food was amazing! Everything! Such attention to detail and the staff were so incredibly helpful! The Painswick This rating is a reflection of how the property compares to the industry standard when it comes to price, facilities and services available. It's based on a self-evaluation by the property. Use this rating to help choose your stay! 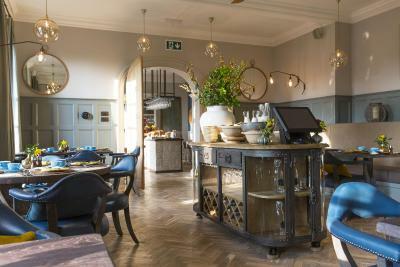 Overlooking the Slad Valley, The Painswick offers accommodations in the village of Painswick, in the Gloucestershire Region. Guests can enjoy the on-site restaurant. The hotel offers free WiFi and free on-site parking. The hotel also offers car hire. Cheltenham is 9.3 mi from The Painswick, while Bristol is 29 mi away. The nearest airport is Bristol Airport, 35 mi from the property. When would you like to stay at The Painswick? Located in the eaves of the garden wing, these rooms boast a window overlooking the garden and the Slad Valley beyond. Guests will also benefit from a 6-foot double bed. These ground-floor rooms are located in the garden wing and come with king-size or twin beds. Guests will also benefit from views of the garden and the Slad Valley beyond. A bath and shower are also provided. Located on the first floor of the main house, this deluxe suite features a 6' 4" four-poster bed, separate living area with log burner and a Juliet balcony with scenic views over the Slad valley beyond. A roll-top bath and shower are also provided. Double rooms in the main house with scenic views over the garden and Slad valley. Spacious double rooms in the main house with scenic views over the garden and Slad valley. 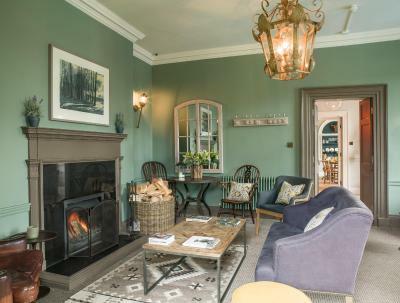 Our house is home to..... A restaurant that flaunts the very best of consummate cooking, Sweet sixteen bedrooms that whisper peaceful slumber and the most perfect pair of tranquil treatment rooms prepped and ready for retreat. House Rules The Painswick takes special requests – add in the next step! One child under 12 years is charged GBP 20 per night when using existing beds. The Painswick accepts these cards and reserves the right to temporarily hold an amount prior to arrival. TBH I thought the village would have a bit more going on shops/cafes etc however it is delightful with stunning walks and countryside around. Bedroom and general Rooms very hot. Bed extemely comfy, really homely welcoming vibe.